Den Forschern des ServDEA-Projekts vom Lehrstuhl für Wirtschaftsinformatik und Informationsmanagement ist es gelungen, einen Beitrag im renommierten "International Journal of Services and Operations Management (IJSOM)" zu veröffentlichen. With respect to the scientific method, reproducing empirical research is a necessary step to develop generalizable knowledge. However, in service productivity measurement and managerial science in general, little attention seems to be paid to replicating empirical studies. One reason could be that many studies do not report their data and methodology in the degree of detail sufficient to reproduce them. 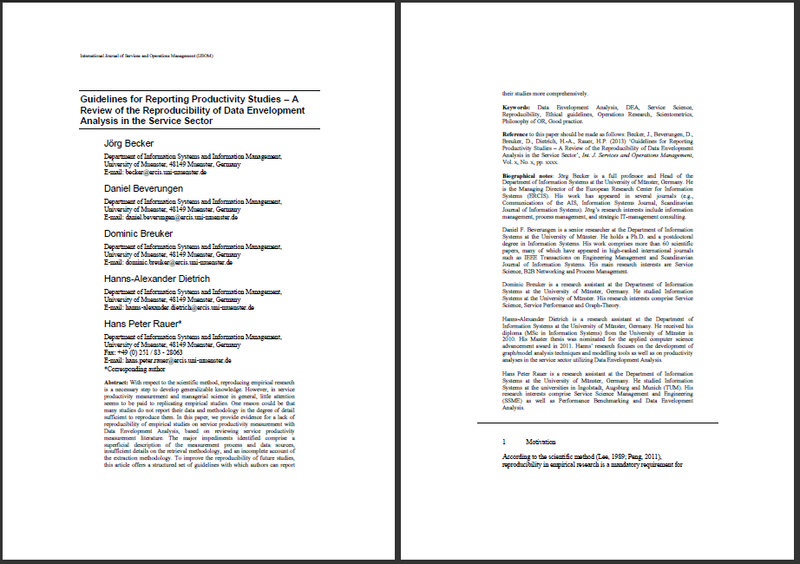 In this paper, we provide evidence for a lack of reproducibility of empirical studies on service productivity measurement with Data Envelopment Analysis, based on reviewing service productivity measurement literature. The major impediments identified comprise a superficial description of the measurement process and data sources, insufficient details on the retrieval methodology, and an incomplete account of the extraction methodology. To improve the reproducibility of future studies, this article offers a structured set of guidelines with which authors can report their studies more comprehensively.